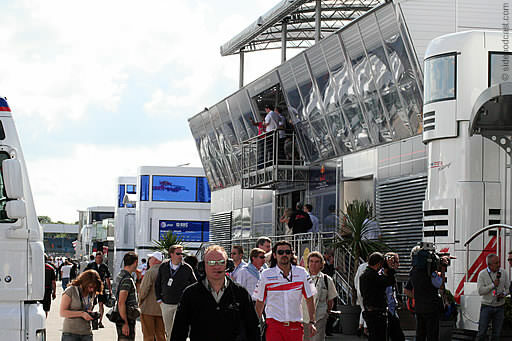 So with the Silverstone test all wrapped up and under our belts, this week sees us heading off to... Silverstone. Damn. 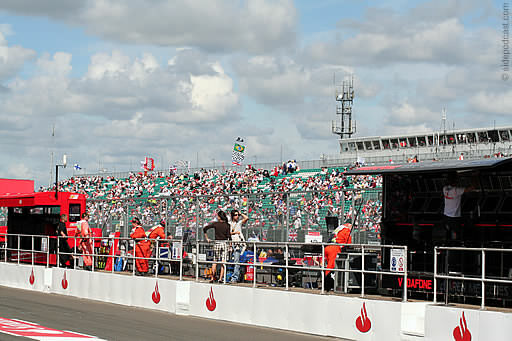 The British Grand Prix is almost upon us and we're fired up for a classic weekend. There's a four way battle at the top of the drivers championship and there's rain predicted for at least part of the weekend. Now I'm not one for encouraging the bad weather, but if it helps mix up the status quo, I'm more than prepared to suffer. As we've already mentioned, because we'll be on the ground at the track this weekend, live commenting is likely to be a riot. We've done our best to cover all eventualities but just to reiterate, we have with us two 3G connections, mobile SMS capability and the ability to phone my mum. Sadly we didn't have time to train a carrier pigeon. Live commenting threads should open about 30 minutes before each session begins. We'd really appreciate it if you'd join us this week. As for the other bits, F1 Minute should be straightforward to record in the field, and the upload should be doable, however F1 Digest may be more tricky. As ever, we'll try our very best. We're already planning on meeting up with maybe half a dozen people during the weekend, if you'll be there too please let us know, and also if you spot us wandering around don't hesitate to poke us and say "hi". Head to Head - Can football compare to the pinnacle of motorsport?